At the outset, I will say that this is quantitatively irrelevant to the outcome of the Kaohsiung mayoral election. Fact: On the evening of December 8th (before the actual voting on December 9th), the DPP held a press conference to exhibit evidence of vote-buying efforts on behalf of the KMT candidate Huang Jun-ying. The evidence was a video tape made from a pinhole camera manned by two DPP student volunteers. Fact: KMT candidate Huang Jun-ying lost by 1,114 votes to DPP candidate Chen Chu. Quantitatively, the video was about getting certain people to attend a political rally and then paying them off to vote. How many people were on that one bus? 93. It is fair to say that this was fewer than 1,114 persons. So the direct evidence could not affect the outcome of the election. However, it may be argued that the press conference may have influenced the votes of an unknown number of persons about the nefarious deeds of the KMT. (Sigh!) Quantitatively, this is unknowable. Good luck on proving that the number exceeded 1,114! Everybody does dirty political tricks in elections because the whole (and only) point is to win by whatever means. This case is irresolvable with respect to any quantitative outcome. However, the legal case will be premised upon whether Chen Chu violated election rules about releasing negative (and possibly untrue) information at the last minute without giving her opponent the chance to respond. The election rules exist precisely for this situation. That will be up to the courts to decide. My interest in this case is the unraveling of the details over time. The Chen Chu campaign headquarters called for an emergency press conference to disclose a compact disc concerning an individual named Black Pine (黑松) who distributed amounts of NT$500 per person to persons to attend the Huang Jun-ying rally. Allegedly, there were two young members from the Chen Chu campaign on bus with license plate XX873 heading towards the Huang Jun-yin campaign headquarters. The passengers were provided with bread and beverage. In the video, a man nicknamed "Black Pine" was walking down the bus aisle. According to the young man from the Chen Chu campaign, "Black Pine" told the people that his name was "Black Pine" and he gave NT$1,000 to each couple on the bus. Another man wearing a Huang Jun-yin campaign jacket told them: "Vote for number one for both the mayor and legislature." The young people also took videos of four members on the bus (including four men and one woman) and the bus driver. There was no video of "Black Pine" passing out the money, but they have his fingerprints. (TVBS; TVBS) December 12, 2006. In the video, there were the clear images of five passengers who reside in one of ten neighborhoods. The TVBS reporter went around these neighborhoods and showed the screen capture images to residents to see if the people can be identified. Two of these people were identified as a mother and her son. Based upon information, the reporter reached a neighborhood in which the Chen family lived. When neighbors reviewed the tape, they said immediately that this was Mrs. Chen and her son. The reporter waited until the housewife of the family showed up and she confirmed that it was her mother-in-law and brother-in-law. Finally, Mr. Chen showed up but he denied that his wife and son would participate in a KMT rally: "My wife does not have time for that! When she comes home, she starts cooking. I should know if she did that. My family supports the Democratic Progressive Party. Frankly speaking, we support the Democratic Progressive Party. We all voted for Chen Chu." (TVBS; TVBS) December 13, 2006. 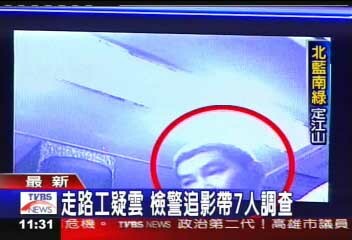 After TVBS located some passengers on the bus, the person known as "Black Pine" was identified as an individual with the real name Tsai Neng-hsiang. He has been interviewed by the prosecutor's office. Tsai admits having given NT$500 to each passenger, but he shifted the blame to another individual Ku Hsin-ming nicknamed "Ku Yi (古意)" who is on the run right now. Tsai is being held under detention for the investigation. According to the testimony of "Black Pine," he did distribute NT$500 apiece to the passengers on behalf of a certain mayoral candidate and a legislature candidate with the same ballot number listing plus bread and beverage to the grand sum of more than NT$40,000 which was provided by the fugitive "Ku Yi." All the 48 passengers on the bus had been recruited by "Ku Yi." 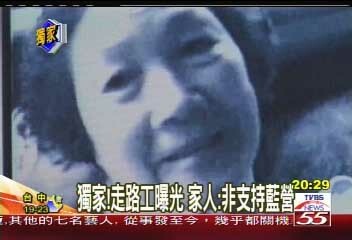 Thus, everything depends on this witness "Ku Yi" who is a fugitive. Ku Hsing-ming, age 46, was convicted of murder in 1988 and sentenced to 16 years in prison. An amnesty allowed him to be released in 1994. He is presently working for a recyling company. 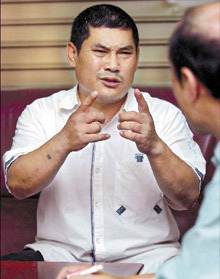 His monthly salary is irregular (between NT$30,000 and NT$40,000). He has several hundred thousand NT dollars in credit card debt, and his monthly payments have been on time. He is co-habitating with a mainland woman named Wang, who works at an entertainment venue. (Liberty Times) An exclusive interview with "Ku Yi." December 14, 2006. Q: Did you direct the paid marchers as described by the Chen Chu campaign? A: I recently made some money and I returned to my hometown. Out of respect for the elders, I asked some of them to attend the Huang Jun-yin rally. I gave them NT$500 in spending money. I put up all the money. It had nothing to do wtih any candidates. Q: Did you want to help the mayoral candidate Huang Jun-yin or the legislature candidate Huang Po-lin? How come the videotape showed people talking about voting for certain people? A: I never touch politics. I'm neither blue nor green. I only found out from the media that Huang is a professor and everybody says that he is a good person. I like him. I heard that Huang was holding a rally on December 8th. So I invited the elders to go and pad up the numbers. When the activity ended four hours later, I handed out NT$500 to each person. An elder wearing a Huang Jun-yin campaign jacket said to me: "You should vote for Huang Jun-yin tomorrow and also help out councilor Huang Po-lin." I said: "Huang Po-lin is Number One on the ballot." Someone else next to me said, "Number One on the mayoral election too." Q: Can you tell me exactly how the money was given out? A: I hired two tourist buses for NT$4,000 each. I wanted to find 90 people, but I ended up with 93 people. At NT$500 each, the total was NT$46,500. I took care of the first bus while my friend "Black Pine" took care of the second bus. I handed out the money on the first bus while "Black Pine" did it on the second bus. At the evening rally, I saw a young couple that I was not familiar with and I did not give them money. I did not check off the names of people getting on or off the buses. There was no name list as such. I just made sure that the numbers were correct. Q: The prosecutor said that you were an "election vendor" and you hang around elections? A: I know nothing about politics. 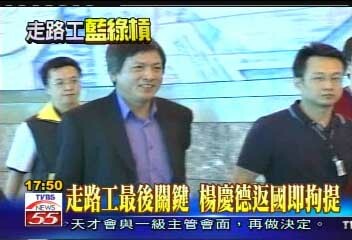 When former DPP legislator Hsu Chi-ming was the mayor, he let me make some money on a few occasions. I hired buses to bring elders to Kaohsiung to attend his banquets. I don't know DPP legislator Lin Dai-hua. When the garbage recyclers in Kaohsiung went to protest at the city government office, I spent some money to bring the elders who collect garbage around here. I felt that their lives were hard. Since I made some money from business, I thought I ought to help these elders who watched me grow up. Q: The prosecutor has been looking for you. How do you feel? A: I did this purely out of my own enthusiasm. I had no idea that giving spending money to elders was against the law. I had no intention of lobbying votes on behalf of anyone. I don't know any Huang Jun-yin campaign workers or KMT workers. I did not even vote myself. I am sorry to see so many innocent people being dragged into this. When I see the struggle between the blues and the greens, I am scared. I have become a tool in the fight between political parties. I can't deal with this. I was afraid to go home. I usually hung out in the park. I wanted to kill myself several times. Q: Why did you want to explain this to Liberty Times? A: When I see Taiwan being so chaotic, I have nowhere to go. Liberty Times is relatively fair. I felt that I need to clarify things quickly so that no more people will get hurt. I hope Liberty Times can help me clarify some things. Q: If you can clarify things to Liberty Times, then why don't you speak to the prosecutor as soon as possible? Otherwise, things will get even more complicated. A: I have tried to get a lawyer through my friends. As soon as I finish answering your questions, I will go to to prosecutor's office. I had no idea that this matter was so serious. The prosecutor can look through my social connections as well as my communication records. The key witness "Ku Yi" has turned himself in while accompanied by his lawyer. He claimed that he did not "buy any votes on behalf of anybody." Q: "Did any candidate give money to you?" Q: "So why are you here today?" A: "I want to establish that I am innocent. But I did give out money." A: "I was not trying to help anyone. I did it all myself." Q: "Why did you hide away for so many days?" A: "Because I was confused. I was confused." Kuo emphasized that he had no position and that he gave out "his own money"; he said that he did not want to help any particular candidate and that he gave out his own money to the rally attendees in order to make the scene more exciting. As to whether the prosecutor will believe him that this is the truth, that is another matter. At first, "Ku Yi" told the prosecutor that nobody else told him to hand out money. After a 10 hour interrogation through the night, he revealed that there was another man named Yang. The Kaohsiung prosecutor said: "'Ku Yi' admitted that he did so at the request of a man named Yang, who wanted him to bring people to the scene at a particular time in a particular area." Police officers went to Yang's home but he has vanished. The police left a summons for him to appear. If he does not appear, an arrest warrant may be issued. It has been disclosed that the man named Yang is the owner of the waste metal recycling plant at which "Ku Yi" worked. Yang is known to be a member of a pro-Huang Jun-yin club. 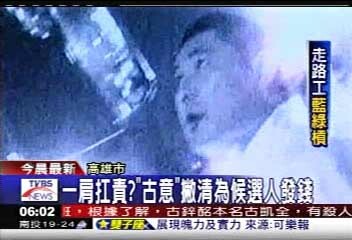 Based upon current information, Yang had left Taiwan for Hong Kong on December 13, and that is why the prosecutor's staff could not find him. (China Times) December 15, 2006. Apart from the man named Yang, there is another person named Su who is implicated. The ties occur through the Yunlin County Kinship Association. Su is with the Yunlin County Kinship Association's Huang Jun-yin Support Group. Su asked Yang, who is from Yunlin County too, to organize supporters to show up at the rally for Huang Jun-yin. Yang in turn asked his employee Ku to organize his neighbors while promising to cover all expenses. A key evidence will be a fax of a map of the rally site sent to Ku from the Yunlin County Kinship Association's Huang Jun-yin Support Group, but there is some confusion as to whether this has been recovered yet. (BCS via Yahoo! News) December 15, 2006. 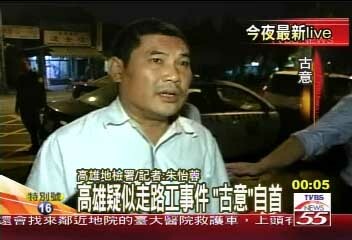 Yunlin County Kinship Association cadre Su turned himself in today for an interview with the prosecutor. Su admitted that he asked the man named Yang to organize people to attend the rally for Huang Jun-yin, but he denied authorizing money for the attendees. He also admitted to communication with the man named Ku about the site where the attendees should go to. (China Times) December 18, 2006. 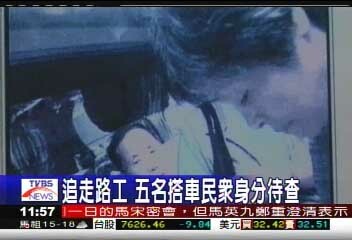 Today at 2:10pm, the man named Yang returned from Hong Kong to Kaohsiung and was immediately arrested by the police. Yang looked calm and said nothing to the media. (China Times; UDN) December 19, 2006. During the combined seven hour interrogation of Yang, he admitted that he accepted the request from Su (of the Yunlin County Kinship Association's Huang Jun-yin Support Group) and subsequently he asked Ku twice to mobilize people to attend the rally. He promised Ku that he will pick up the costs, but he did not ask Ku to pay the people. Although Yang's testimony was similar to that of Ku's, the police have reviewed the telephone records and found that there had been frequent communication among the three. Thus, the police suspect that Yang must have met Ku before he left Taiwan for Hong Kong, and they may have coordinated their testimonies so that Ku ends up accepting all the responsibility. (Taiwan Headlines) Prosecution rejects indictment request against Kaohsiung mayor. February 2, 2007. The Kaohsiung Prosecutor's Office decided Friday not to indict Kaohsiung Mayor Chen Chu over allegations that she had made false vote-buying accusations against her rival Huang Chun-ying on the eve of last December's mayoral election. Huang, the candidate of the opposition Kuomintang (KMT) , asked prosecution authorities to place charges against Chen and three campaign aides, after losing the Dec. 9 mayoral election by a narrow margin, over what he called their violation of the Public Officials Election and Recall Law. According to Huang, the Chen campaign's presentation of a video at a late night news conference ahead of the election allegedly showing vote-buying on a bus returning from a Huang rally had seriously tarnished his clean image and hobbled his chances of electoral victory. Huang claimed that the allegations were a plot of the ruling Decmocratic Progressive Party (DPP) to win the election by smearing him. After extensive investigations, the prosecutor's office said in a ruling that the vote-buying incident was not staged by the Chen Chu campaign. A careful scrutiny of the videotape presented by the Chen campaign indeed showed that two men were giving cash to passengers aboard the bus and reminding them to vote for Huang, the prosecution authorities said, adding that some individuals aboard the bus were wearing the Huang campaign vests. It was understandable that the videotape would lead the Chen campaign into believing that somebody in the Huang campaign was bribing voters with cash, the prosecution said in the ruling. Against this backdrop, the ruling said none of the four accused should be prosecuted as they didn't purposely defamed Huang. "They were just telling facts while presenting the video, " the prosecution ruling concluded. The three other accused were DPP Legislator Kuan Pi-ling, Chen Chu's chief campaign manager Chen Chi-mai and her spokesman Hsiao Yu-jen. After learning of the prosecution's ruling, Hsiao said it is hoped that KMT Chairman Ma Ying-jeou and Huang Chun-ying can make a public apology over their false accusation. (China Post) Court annuls Kaohsiung mayor's election victory. June 16, 2007. A district court yesterday annulled Kaohsiung Mayor Chen Chu's victory in an election that earned her the mayoral seat, saying she violated campaign regulations. Chen, from the ruling Democratic Progressive Party said she would appeal, while the Central Election Commission (CEC) said she would remain in office pending the outcome of the appeal. The Kaohsiung District Court ruled in favor of Kuomintang candidate Huang Chun-ying, who sued Chen for making untruthful vote-buying charges against him. "Chen's team ambushed the plaintiff with negative campaigning measures during a period wherein it is banned by election rules to engage in campaigning activities and rendered the plaintiff unable to defend himself and clarify the allegations," the court said in a statement. "This resulted in unfair treatment of the plaintiff and (Chen's) actions violated the election laws ... the court therefore declares that Chen's election victory invalid," it said. Chen defeated Huang by a narrow margin late last year in an election marred by vote-buying allegations. Huang alleged that one day before the vote, Chen's campaigners had given a press conference on the election's eve saying that he had tried to buy votes in a bid to sway the polls. Five masked men told the press conference that they had witnessed vote-buying and the claims were aired by local television stations in what Huang described as a "set up." Huang claimed that campaign irregularities had led to his defeat of only 1,114 votes in the December poll. Prosecutors have determined that Huang had nothing to do with the alleged vote-buying. "It is an irresponsible verdict, resulting in the defeat of the entire Taiwan of democracy," said Chen in a written statement shortly after the verdict was handed down. The statement backed claims of the court's irresponsibility by citing the presiding judge as saying he would let the high court make the final decision because he knew that the defendant would file an appeal. Chen later called a press conference, saying she wouldn't go as far as to describe the verdict as marking the "darkest day of Taiwan's justice." But she said she could not understand why she became a culprit for fulfilling a citizen's duty by blowing the whistle on vote-buying. She stressed the city government's operations will not become idle because of the verdict. She said she believes she will be eventually vindicated. But Huang described the ruling as "belated justice." 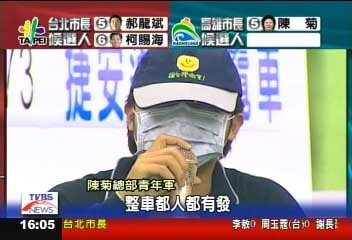 "Justice has returned to all residents of Kaohsiung City. I hope the verdict will be a milestone for Taiwan's democratic development," he said. "We hope the ruling will serve as a warning to those who try to manipulate election results by making unfounded allegations," Huang's lawyer Lai Su-ru told the TVBS network. Chen can appeal the verdict within 20 days, and the high court will have to return a verdict within six months. The CEC said if Chen loses her appeal, she will be stripped of her office, and a by-election will be held within three months of the final verdict.